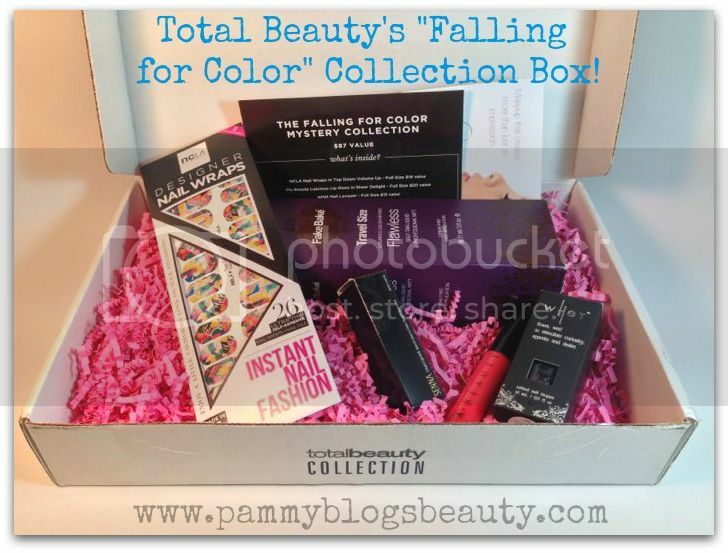 Pammy Blogs Beauty: "Falling for Color" Total Beauty Collection Beauty Box: Box Opening! "Falling for Color" Total Beauty Collection Beauty Box: Box Opening! It is time for a beauty box box opening post! 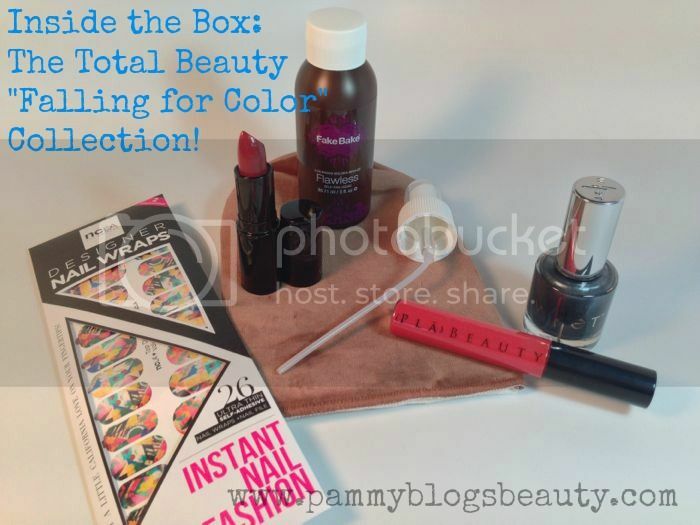 This time I am sharing the "Falling for Color" Total Beauty Collection "Mystery" Box!!! Are you are familiar with Total Beauty's Collection boxes? Unlike many other beauty boxes, there is no subscription required with Total Beauty Collection boxes. Periodically, Total Beauty curates a box and releases it for sale on their website. The boxes are an amazing value and a great way to sample some fabulous full sized products that you might not have otherwise selected! The "Falling for Color" Total Beauty Collection box is a recent launch and it is still available at Total Beauty. It contains everything you need to start the season off right ... in the most stylish way, of course. The box is valued at over $75 in products and is available for just $25! Want to see what is inside? Total Beauty reveals the NCLA Nail Wraps and the Senna Cosmetics Cream lipstick...and guess what? I am ready to reveal the rest of the "Mystery" box! Click "read more" below if you want to see what is inside this beauty box!!! The Total Beauty Collection "Falling for Color" Mystery Box Reveal: Box Opening!!! I am ready to share the complete contents of this Total Beauty Collection box! :) Like past Total Beauty Collection boxes, the box is well packaged and has a fun "gifty" feel with the cute pink shredded paper inside. Inside the box: 4 Full Sized Products and one "Travel Size" Product!!! NCLA Nail Wraps in "Top Down Volume Up" - $16: These are really cute!!! As someone who loves nail art yet struggles to do any free-hand, I love nail wraps. They are an easy way to get a nail art "look" instantly and with no skill, lol! 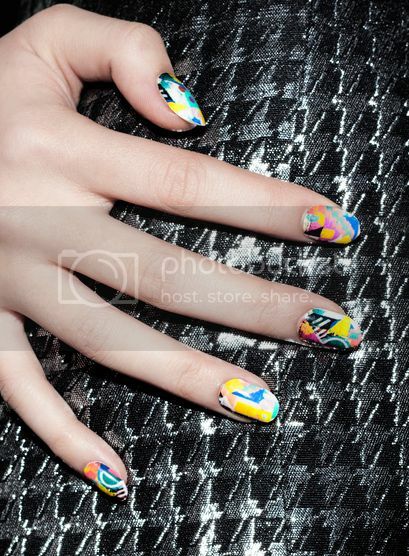 ;) The pattern on these nail stickers is super artsy and fun! I really can't wait to wear these. Senna Cosmetics Cream Lipstick in Ruby - $20: I really like Senna Cosmetics lip products. Funny, I have only tried them through various beauty boxes. 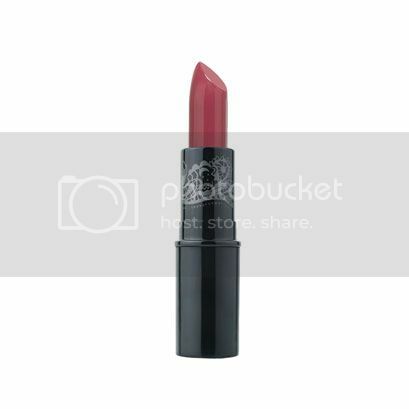 This cream lipstick in Ruby is a great deep Fall and Winter color! While I tend to gravitate towards pinks and peaches year round, I do love to experiment a bit with darker lip color in the colder months. See, this is where a beauty box really helps me to expand my look. :) I am much more likely to experiment with colors that I don't normally wear if I get one in a beauty box! I certainly look forward to wearing this! Fake Bake Sunless Taner - $16: Ooooh! I have always wanted to try Fake Bake! It is a tanner that I have heard of and always have wanted to try out. This "travel size" is actually quite big at 3 fl oz. It comes in a spray container with an application mitt. As a fair skinned girl, self-tanners are pretty much the only way that I get tan. So, I can't wait to try this! :) Have any of you tried Fake Bake before? Pla Beauty Lip Gloss - $20: This is another new brand for me! This lipgloss is in the shade "sheer delight", which is a pretty sheer red shade. The lipgloss has a slightly fruity scent (mind you, I am a bit congested with my allergies, so please correct me if I am wrong on the scent, lol!). If you are normally afraid to wear reds, a gloss is the way to go. It gives a pretty red tint without looking too bold. The box contains items that I have never tried before and exposes me to new brands as well! I am especially excited about the NCLA nail wraps and the Fake Bake tanner! In general, beauty boxes are a great way to get out of a makeup "rut". If you feel like you always use the same brands or products over-and-over, a beauty box is a really good way to branch out and try new things. Plus, beauty boxes are just so darn fun to open!